The Bulkfiller system allows for a massive amount of ink to be drawn up. This enables our users to have long writing sessions, as well as being able to leave your ink bottle at home when travelling because your Bulkfiller hardly runs out of ink. Another benefit is the dual chamber and being able to close the main ink chamber to avoid leaking during air-travel. The nibs fitted on the Bulkfillers are German-made Peter Bock nibs. High-quality nibs but, like any other manufacturer, not without flaws. Conid’s nib specialist takes a look at each and every nib, adjusts and/or grinds it where needed and makes a writing certificate before shipping it off to the future owner. This ensures that our nibs will perform just as requested and expected from a high-quality product. The Bulkfiller system is not only good for its huge ink capacity, it also helps in flushing the internals as it creates quite a lot of turbulence inside the barrel. Changing inks has never been less time-consuming. When changing inks it is recommended to flush your fountain pen before drawing up the new color. The Bulkfiller system actually helps you to clean your Conid. Use (lukewarm) tap water for the best results. Conid uses only the best materials for its Bulkfillers. Titanium for all of the metal parts, bar the piston rod which is made from SAE 316 (stainless steel). Delrin for the matte black parts, high-grade ebonite for the polished parts and stress-free cast acrylic for the clear parts. Each material has its own benefits and strengths. Is included. Please feel free to read our FAQ’s and How To’s. If you would like to contact us, please visit our contact page. Conid Bulkfillers are quite unique on its own but one can always make it even more special with a personalized laser engraving on the titanium clip. Any kind of word, symbol, date, drawing or number can be chosen. Only one limitation: the size of the text. You have bought a full demonstrator Bulkfiller but, after a while, decide that a black cap was actually the one you needed? Accidentally dropped it and damaged the hand nut? No problem at all! Due to the precisely machined parts, everything is interchangeable. We can send you spare parts just as easily as it is swapped. Please read the story of Conid. 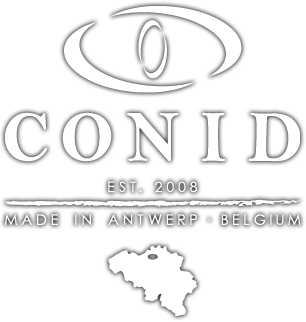 Conid is working on being as ecologically as possible and therefore wants to incite its customers to do the same. We have made a strong, lightweight metal box which can, of course, be used to store your Bulkfiller in but we want you to use your Bulkfiller. This means that you have a strong box at hand. We would love to see you all use it for something else. For example a pencil case for one of your children, storage for bolts and screws or (even better) as a box for your now unused fountain pens of other brands than Conid. ?